There was very little use for field fortifications in the pitched battles of the Civil War (a few small earthwork defences were hastily constructed before some battles), so most of the operational history of fortifications is focused on defences built around towns, castles and country houses; and the siegeworks built against them. Every place presented a different set of conditions demanding a range of responses from defenders and attackers alike. One cannot evaluate period fortifications without taking into consideration a variety of circumstances such as the availability of engineers or persons knowledgeable in military science, the time available for construction, money to cover costs of building and maintenance, and the availability of a workforce to build them. Other critical factors included the topography of the site, soil type and depth, and the weather conditions. The number of troops available for garrisoning or attacking fortified places, not to mention the weapons available and whether there was an adequate supply of shot and powder, all had a major influence. Similarly the supply of entrenching tools was paramount. And obviously the supply of water and food could affect the outcome of a siege. Even if the right circumstances prevailed, a commander might, for instance, site his guns poorly; or an engineer fail to fortify correctly. These and many either factors could determine the outcome of a siege. Besides a painting of the siege of Oxford, there are no contemporary illustrations of Civil War sieges. However, contemporary scenes from the Continent such as this engraving of the siege of Arras. France, in 1641 provide some clues as to the appearance of a mid-17th-century siege. above The Parliamentarian siegeworks built around Pontefract Castle,Yorkshire, in 1648. from an engraving published in the 19th century. A complete circumvallation encircled the castle linking a variety of earthwork forts, hornworks and batteries. A comment in a contemporary letter illustrates some of these shortfalls. Lieut. Col. Jones, a Parliamentarian officer, writing to his superior Sir William Brereton in May 1645, despaired that 'were there spades to entrench and victuals for the soldiers or a sufficient strength of horse to make provision for the foot, there were no reason to raise the sieges (of Chester and Hawarden Castlel'. The final, and perhaps most significant, factors were intangibles such as morale, leadership, ability and skill, loyalty, or the lack of, and motivation. Any one of these factors and those above could play a critical role in determining the effectiveness of defensive as well as offensive fortifications. Contemporary siege accounts, notwithstanding their occasional bias or distortion, provide some clues to the success or failure of fortifications, but as every siege was different, no clear pattern emerges. This makes an overall assessment of the effectiveness of Civil War fortifications difficult. In some cases, a site that appeared well fortified might have been taken quickly, while a similar place with inferior fortifications might have withstood a lengthy siege. Some places that had virtually no 'modern' outworks were able to fend off attack for weeks or months. Clearly one cannot generalise about fortified places and each must be considered on a case-by-case basis that is beyond the scope of the present work. What do contemporary writers have to say about fortified sites during the war? Subsequent English authors of fortification studies such as Thomas Venn and John Cmso fail to make mention of the English works, preferring instead to use continental examples. The Parliamentarian veteran and 'Master Gunner of the City of Worcester', Nathaniel Nye, in his Art of Gunney of 1670 makes a brief mention of the 'Leaguer' before Worcester and his artillery observations of various structures and fortifications in the city but does not provide any assessment. The notorious Parliamentarian pamphleteer William Prynne, who suffered the indignity or having both ears cut off for various comments against officialdom and was imprisoned in Pendennis Castle during the Protectorate wrote a lengthy diatribe in 1658 shortly after his release, in which he attempted to downplay the effectiveness of fortified places in wartime. Echoing the earlier sentiments of Sir John Meldrum, he stated categorically that fortified places attracted trouble. Fortifications, he said, were 'despicable, worthless, barren Witts, or Clods of Earth, scarce worth two hundred pounds a yeer', and he proceeded to recount the miseries that fortified places endured in wartime and the economic and physical disasters they created. He singled out Bristol and Hereford as places that had spent considerable amounts of time and money on fortifications, yet were taken within a few days or hours. He criticised the deliberate destruction of the suburbs of Bristol, Exeter, Taunton, Lincoln, York and Colchester for the sake of better defence. He noted that many houses, small garrisons and castles that suffered total demolition, and suggested that had Raglan Castle, Basing House, Rowden House, Camden House, Lichfield Close, above The Parliamentarian siegeworks built around Pontefract Castle,Yorkshire, in 1648. from an engraving published in the 19th century. A complete circumvallation encircled the castle linking a variety of earthwork forts, hornworks and batteries. 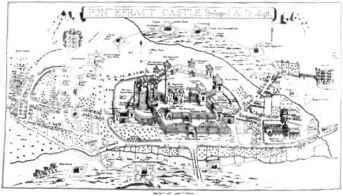 A 19th-century plan of the fortifications built at Leicester in 1643 as they might have appeared in the Civil War. The angular outworks can be distinguished from the old walls of the medieval town.Three distinctive hornworks project from these outworks. 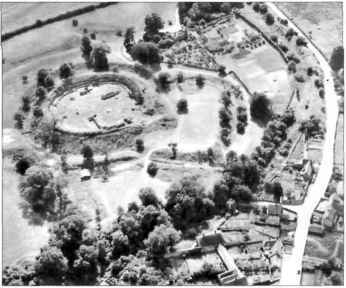 Banbury and Pontefract Castle not been fortified and garrisoned, they would all have escaped. Next he listed Plymouth, Exeter, Lyme Regis, Taunton, Bristol, Gloucester, Worcester, Oxford, York and Hull as places that had endured multiple sieges. And because some places like Bristol and Exeter were taken and re-taken, Prynne argued that they suffered even more, and notes that of all the places besieged during the war, only Gloucester, Hull and Lyme Regis escaped being taken. He concludes that fortified places contributed to the length of the conflict and without them, the Civil War would have been over in less than half the time. Prynne was a non-combatant during the war but his ideas cannot be dismissed outright. In contrast was David Papillon, who did participate as an engineer and was a proponent of fortifications. Writing at the end of 1645 while the war was still in progress, he lays the blame for the failure of some fortified places more on the inability of the defence committees and governors in not providing enough ammunition, food, and equipment to withstand a siege. He noted that the Royalists were more 'provident' and gave as examples the long resistance of Basing House, Lathom House, Carlisle, Skipton and Scarborough Castles, and Chester. He went on to suggest that had the Parliamentarians created entrenched camps before Newark, and the castles of Dudley, Pontefract, Banbury and Donnington, they would not have been forced to raise their sieges. 'If we had been in an intrenched Camp, an Army six times as great could not have forced us to a retreat.' This failure prolonged the war in Papillon's estimation. He agreed with Prynne in his criticism of the destruction of suburbs but for different reasons. Using the failure of Leicester as an example, he argued that keeping suburbs only added to the strength of the defensive cordons because the houses could be turned into bulwarks that required less men to defend. This town was singled out for further criticism for its failure to include some rising ground within its 'Line of Communication', which contributed to the loss of the place. Another example used by Papillon was Northampton, where the citizens proposed to destroy the hamlet of Cotton End should the town be threatened. He again cautioned against this, suggesting as an alternative that the houses in the hamlet should be turned into defensive bulwarks, making that side of the town impregnable. Some places were successful simply because they were so well fortified that they deterred any would-be attackers. London and Oxford, the respective capitals of the belligerents, were probably the best examples of this, although Oxford did experience being 'blocked-up' and besieged on two occasions. Throughout the war, the defences of London were never tested hut this was more due to the failure of the Royalist armies to get within striking distance of the capital after 1642. The Royalists were aware of the extent of the fortifications and how formidable a task it would be to overcome them. Spies were passing in an out of the capital and there was a rumour widely circulated that Prince Rupert had come to the City himself 'disguised like a woman, and viewed all the several workes and trenches'. capital, its defences consisted of forts connected by an earthen bank and ditch that stretched for over five miles. And therein lay the problem, for Bristol had only 1,500 men to defend this long perimeter. The Royalists were able to break into this line in 1643 and capture the city. Realising the need for a larger garrison, they immediately set about increasing the number of men available and refortifying the place, but by September 1645 when the Parliamentarian New Model Army attacked, the garrison had dwindled to around 1,000 men and was easily overcome. This would have been London's Achilles' heel had it been attacked. With a vast perimeter of over 11 miles in length, the city would have been most difficult to defend, as the Venetian ambassador noted in 1643. Papillon himself was very critical of the London defensive perimeter, suggesting that 'having at every two hundred and fifty yards distance an Angle to forme a strong, complete, and defensible Bastion' would have been preferable to the 'sleight, winding Angles, and ill flanked Redouts, wherewith it is now fortified'. Also a single bank 'is farre safer' than the small double ditch with a 2ft bank between built around London. I find Oxford much stronger fortified that it was when I was here last; the new works being finished, and the whole north side pallisadoed, so that contrary to my expectation there was no way left to take it, but by approach or blocking up, either at a near distance entrenching about it, or in a remote way by taking in the garrisons about it. The place is not difficult to be taken any of these ways. 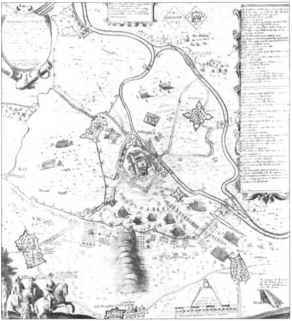 Beyond London and Oxford, most towns and cities were besieged at one time or another, as Prynne noted, and few were able to withstand enemy attacks for prolonged periods, in some cases fortifications held the enemy at bay, as at Newark in early 1644, or were enough to force the enemy to invest a place rather than storm it. The new Royalist defences at Exeter, consisting of a new circuit containing three large forts and a ditch 7ft deep, deterred an attack by the Parliamentarians in the autumn of 1645. Similarly, when they came before heavily fortified Newark around the same time, the Parliamentarians decided to invest the place with siegeworks rather than attempt a storm. It was only by stranglehold that the town was eventually forced to surrender in May 1 646. It has been suggested that few Civil War sieges ended in a successful storming but many places endured the sufferings of them. Edmund Ludlow himself, prior to his capture, led a determined effort to withstand a Royalist siege at Wardour Castle in Gloucester, and later described his experiences. 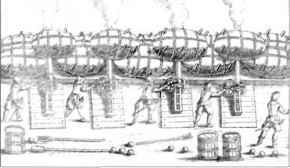 From the battlements of the castle he observed the Royalists raising a battery but as the guns in this failed to effect much damage, the enemy decided to try to bring the walls down by explosives. 'They brought together about two dozen of oaken planks three inches thick, which they endeavoured in a dark night to set up against the castle wall,' but they were discovered. The Royalists then began to dig but were discovered and the garrison threw down hot water and melted lead but with little success. Hand-grenades finally dislodged them. 'We obliged them to quit their work, and to leave their tools behind them ... their trenches not being finished to secure their approach to the outhouses.' Eventually, the Royalists achieved success when miners were able to burrow under the walls and detonated explosives that rocked the place. Ludlow and his garrison finally were forced to surrender. Ludlow also recounts a treacherous act involving fortifications. Parliament had decided to fortify Abingdon in Oxfordshire. Secretly, the Parliamentarian governor Colonel Brown was in correspondence with the Royalist Lord Digby, secretary to the king. Brown 'promised him that, so soon as he had finished the fortifications, and received all things necessary from the Parliament to defend it, he would deliver it to the king; by which means he kept the king's forces from interrupting him till he had perfected the work.' At the last minute, Brown changed his mind, infuriating Digby, who proceeded to publish their correspondence. Treachery was also to blame for the fall of several places including Corfe Castle, Dorset, and Beeston Castle, Cheshire. raised a square Work within pistoll shot of our Fort of Stamford, on the North-east side, and from thence were drawing of a Line with Halfe Moones to surround the said Fort, thereby to hinder our reliefs from coming unto it. To prevent which, the same day we fell on the Enemy in their New Worke they had raised ... we got their Halfe Moone, and after three houres hot fight, their close Worke, and in it Captaine White and fifty other prisoners: in which Work we put a Guard that night of thirty Musquetires. After we had gained the Enemies Worke the second time we slighted it: but to prevent the like approaches, in regard Mount Stanford being a small Worke, and very untenable of Itselfe, much less to keepe so large a circuit of ground as it was built to defend, we were necessitated to draw a Line of Communication both on the East and West side of the Worke, to maintain a long ridge of ground, with Halfe Moones at each end of the Line, which we defended diverse dayes with extraordinary duty to our men, and divers skirmishes with the Enemy, till the third of November, when the Enemy planted their Batteries within Pistoll shot of our Forts; and on the fifth of November battered our Worke with two hundred Demy-Cannon and whole Culverin shots, besides other smaller Cannon that continually played on us, and flanked our Line from Osan Hill, whereby breach was made in the Fort at severall places ... the breach we repaired in the night, thickening the Rampart as much as the smallnesse of our work would admit, and strengthened the weakest places with Woolpackes; The next day they continued their Battery till noone, with too much successe, yet so as no considerable beach was made that day: the enemy whither they had 52 intelligence of the want of provisions and Ammunition in the Fort, about one of the clock fell on with horse and Foot on our Ilalf-moons is Line, where we had reasonable guard: but tired with eight daies duty and long watching after an hours skirmish were enforced to retreat from the I lalf-moon and Breast work, and were taken by the enemies Horfe who came on the backs of them. 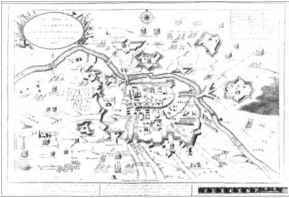 Day after day, the siege continued in this to and fro manner with attacks and counter-attacks upon the respective fortifications, and the building and rebuilding of earthwork fortifications, but the town held and was never taken by the Royalists. Gloucester was another city that was able to fend off Royalist attacks throughout the war, although had a Parliamentarian relief force not arrived in 1643 the city might well have fallen. Nonetheless, the city's defences were a factor. With the River Severn serving as a defensive barrier on one side, earthworks were constructed with five bastions on two other sides. The earth for these bastions was excavated creating a ditch as deep as 12ft in some places and around 30ft wide. Water was diverted into the ditch, creating a formidable moat. With these combined water-formed defences, the city was approachable only from the south-east, but any would-be attacker would be faced with the 30ft medieval wall backed with earth. In front of the wall was a 15ft ditch. The Royalists attempted to batter and mine the wall anil were almost at the point of success when the Karl of Essex's Parliamentarian force showed up. John Dorney, town clerk of Gloucester, collected accounts of the Royalist siege of 1643 and these make several references to the fortifications. On 6 August, he noted that 'this day we wrought hard in the amending and repairing of our Bulwarkes', and several days later wrote that 'our Women and Maides wrought all this after-noone in the little meade out of our workes in the very faces of those houses, in fetching Turfe for the repairing of our workes: we were forced now through want of men for the guarding of the City it selfe'. Due to the lack of men, two sconces had to be evacuated. On the 11th, Dorney noted that the Royalists had begun to dig entrenchments on the south and east of the city within musket shot of the city walls. Several members of the garrison sallied out and beat the enemy from their trenches 'and brought away many of their Shovels and Pickaxes'. There is a reference to the 'lining of our Towne walls from the South to the East gate' with earth in response to a threat from a Royalist battery. The South port was blocked up and a 'damme' of earth was built against the drawbridge; earth was also piled up by houses between the gate and the drawbridge. When the Royalists started to batter the wall, the aVv/ens Wocked up the breaches With woo\packs and cannon-baskets. A Royalist attempt to fill in the moat with bundles of faggots was beaten off by musketeers on the wall. The garrison were constantly building breastworks to block up access to the city and piling earth against walls to absorb cannon lire. A sconce was constructed to provide cover for any attack in the Fryar's Orchard section of the city. An engraving from Lo Castromentation (1618) showing cannon in a battery using woolpacks for cover. The use of wool for defensive purposes is documented at several places during the war. Woolpacks could absorb bullets with ease and were available in quantity. 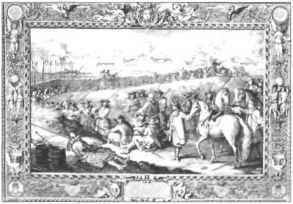 An engraving of the siege of Tournay, France, in 1667, showing the operations of a typical 17th-century siege with musketeers and pikeman entering the approach trenches. At the end of the trench, soldiers carry bundles of wood to make blinds for cover. a shot or two, the besieged garrison called for a parley and surrendered. It was all over within two days. After the house was plundered, it was set on fire to render it useless. 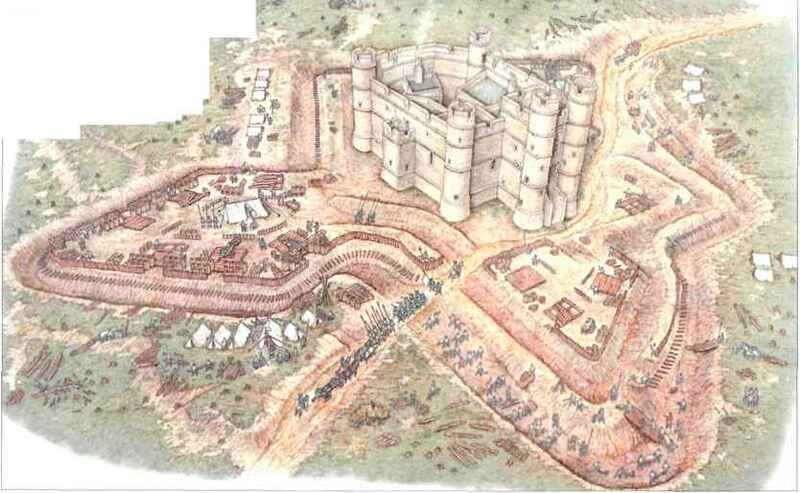 Many of the lengthiest sieges occurred around fortified garrisons, the most notable being at Lathom House, Lancashire, Corfe Castle, Dorset, and Basing House. Hampshire. The question can be asked whether the outworks constructed during the war at some of these places contributed to the ability of the defenders to resist assault for so long. One can immediately dismiss Corfe for the beleaguered garrison never constructed defences beyond the walls of the castle and the only steps that were taken was the construction of a battery within the castle, along with the packing of earth against the walls. In this case, the siting of the castle high up on a natural rise made it difficult both for the Parliamentarian batteries to bring their guns to bear and for mining operations to be carried out. 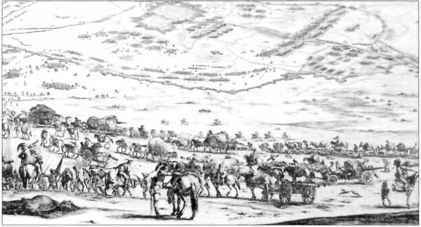 The resolution of the garrison under L.ady Bankes and the failure of the Parliamentarians to bring enough resources to achieve victory also ensured that this siege dragged on for many months. Lathom and Basing were defended with earthworks but once again the determination of the garrison to fend off attack was more important than the strength of the outworks. At Lathom, repeated sallies against the Parliamentarian besiegers damaged or destroyed their siegeworks, while earth piled up against the walls absorbed the cannon shot. Palisades were constructed on both sides of the moat that surrounded the building, which had 6ft-thick walls supported by nine towers. Many ageing castles proved remarkably resilient against modern artillery and were able to hold the enemy at bay for some time. Hawarden Castle in Flintshire provides one example. The 13th-century castle sitting atop an old motte was able to withstand two sieges against it without the luxury of earthen defences. The Parliamentarian besiegers in 1645 dug a circumvallation completely around the place and commenced mining operations and the construction of batteries. Mining failed to make an impasse and breaches caused by Parliamentarian ordnance were stopped-up by the garrison. This caused fear and frustration among the attacking troops and eventually the siege was raised. In the following year, the place withstood a ten-week siege before it was forced to surrender in March 1646. Were offensive fortifications superior to defensive fortifications? Once again, it is difficult to generalise. 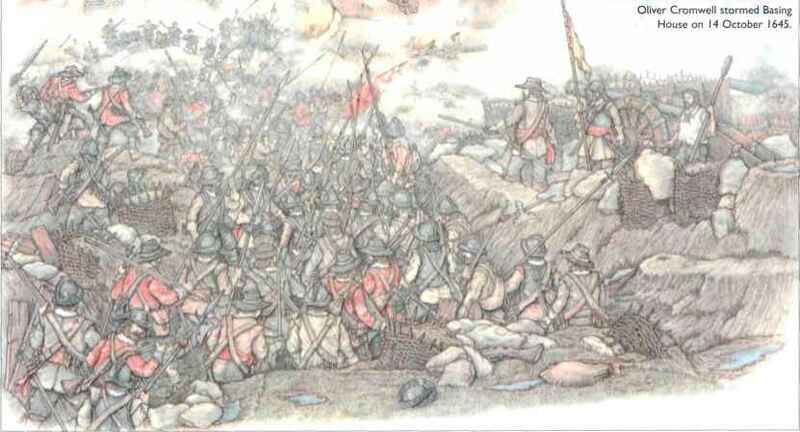 Towards the end of Vhe war m 1645/46 and ui the second phase in 1648, the better-trained New Model Army was able to bring sieges to a successful conclusion. The Parliamentarian cordons around Colchester and Newark created strangleholds that forced both places to surrender, but in these cases the besieging forces were adequately supplied with men and equipment to see the job through. In smaller sieges, the besieged garrisons were frequently able to sally out and destroy the siegeworks. In summary, the temporary fortifications built during the British Civil Wars provided more of a psychological than a physical barrier. With enough resources, they could be easily overwhelmed but such resources were rarely available.